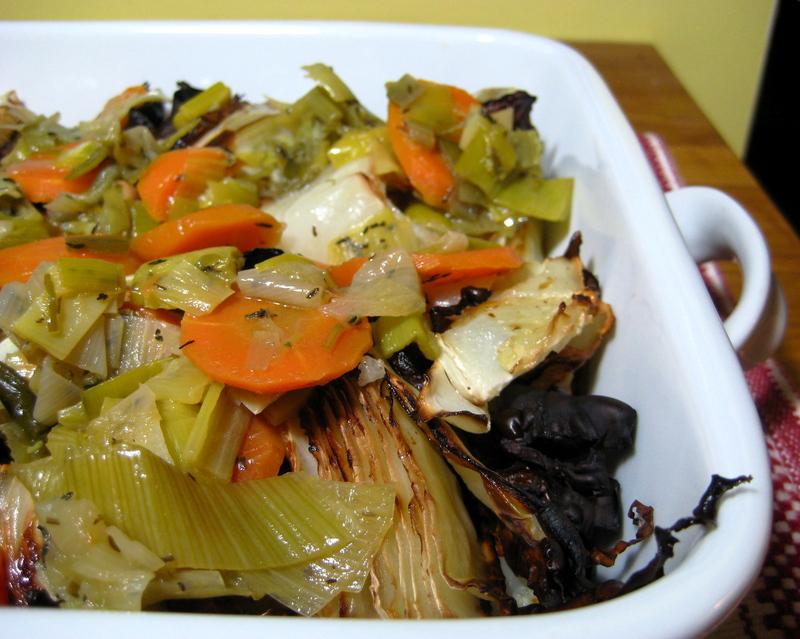 Roasting the cabbage brings out its inherent sweetness, rounded out by a hint of smokiness coming from the crusty edges. The leek mixture is simmered in apple cider; a perfect complement that you’ll want to use it in your repertoire again and again for its delicious flavor. Preheat the oven to 450F. Line a baking sheet with aluminum foil. Remove the tough outer leaves of the cabbage. Cut into wedges about 1 to 1 1/4 inches thick, cutting out the core when necessary. Arrange on the baking sheet. Drizzle with 2 tablespoons of the oil and sprinkle with salt and pepper. Bake for about 30 minutes until brown and crispy, then flip and bake an additional 20 to 30 minutes until cabbage is tender and crispy on the edges. Meanwhile, heat the remaining 2 tablespoon of the olive oil in a medium saucepan. Add the leeks and carrots. Cook until softened, about 8 minutes. Add the apple cider and thyme. Bring to a boil, then reduce and let simmer for about 20 minutes. Remove the lid and continue to cook until the cider has thickened and nearly absorbed, about 10 minutes longer. When the cabbage is finished roasting, transfer it to a serving dish. Top with the leeks and carrots. Let stand about 20 minutes before serving for the leek mixture to meld into the cabbage. Serve warm.